Want your city to fix its traffic issues? 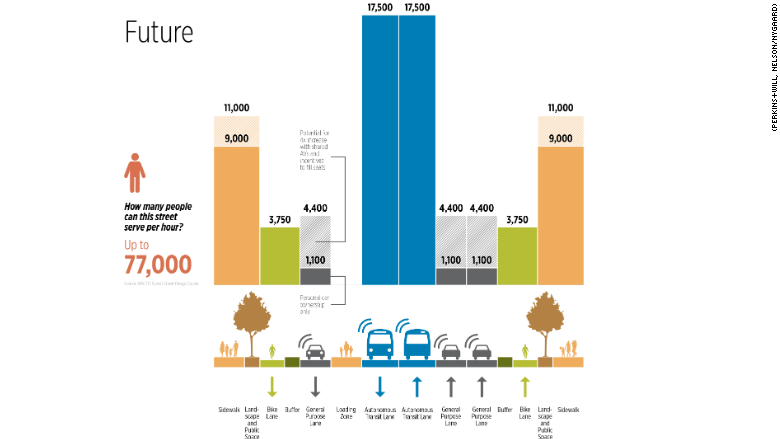 It should start by narrowing streets and planting trees where cars currently drive. A new partnership with Lyft and transportation experts highlights the overlooked secrets of good urban design -- and the answers may sound counterintiutive. For example, building more lanes to transport more cars isn't a way to cut down on congestion. Wilshire Boulevard's design is typical of the city boulevards -- there are currently 10 vehicle lanes, including two lanes that buses share with vehicles. 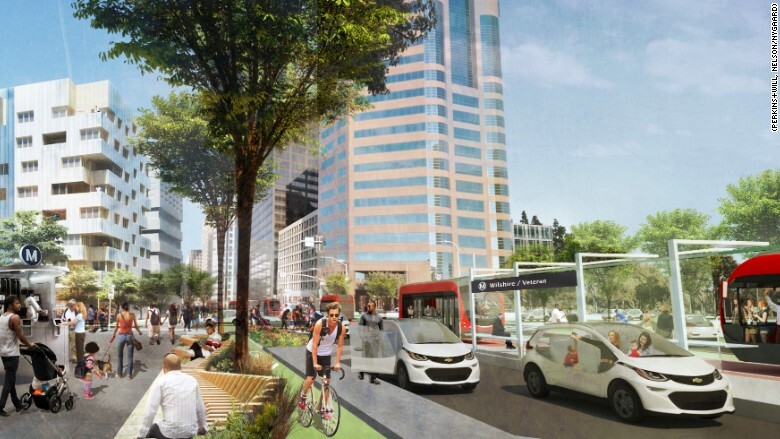 But Lyft's design includes trees, protected bike lanes, a loading zone for ridesharing vehicles, three narrowed lanes for vehicles and lanes for autonomous buses. 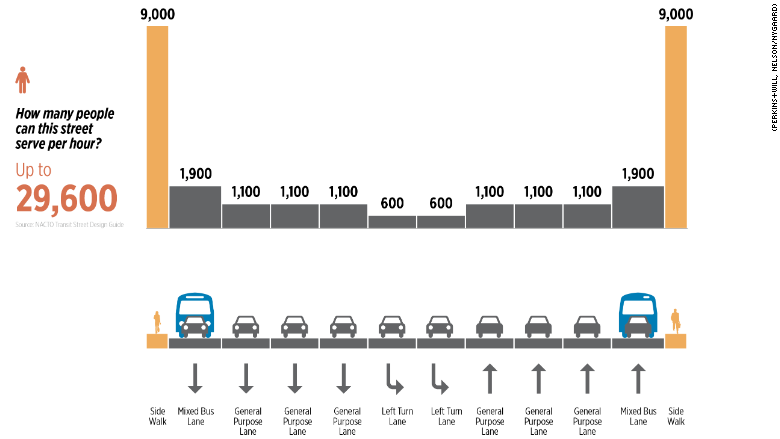 The concept also rewards buses with exclusive travel lanes. The design features a widened sidewalk, landscaping and benches for people to sit on. It creates more welcoming spaces, so people are comfortable walking to and using public transportation. The firms believe the changes would bring remarkable results: twice as many road users, such as motorists and cyclists, could use the redesigned street and vehicle lanes could transport four times as many people as before. This would be also attributed to a shift toward shared autonomous vehicles. In Los Angeles today, 68% of people drive alone. It also takes 10 times as much road space to move someone in a car as any other mode of transportation, according to Jeff Tumlin, director of strategy at Nelson/Nygaard. This illustrates how many people can currently use Wilshire Boulevard in Los Angeles. Tumlin believes if people see public transportation or biking as a good alternative to driving, they're less likely to rely on their car. "The best way to make driving possible is to make it easy for drivers to do something other than driving," Tumlin told CNN. Lyft is also partnering with the Southern California Association of Governments on its 100 Hours Campaign, an effort to reduce congestion, to make this vision of smarter streets a reality. The company, not surprisingly, believes it should largely start with carpooling. It's offering 20% off Lyft carpooling rides in the next month in the Los Angeles area. Los Angeles is already working to fix its traffic issues. By 2035, the city's mobility plan -- released in August 2015 -- calls for half of trips to be made on public transit, biking and walking. 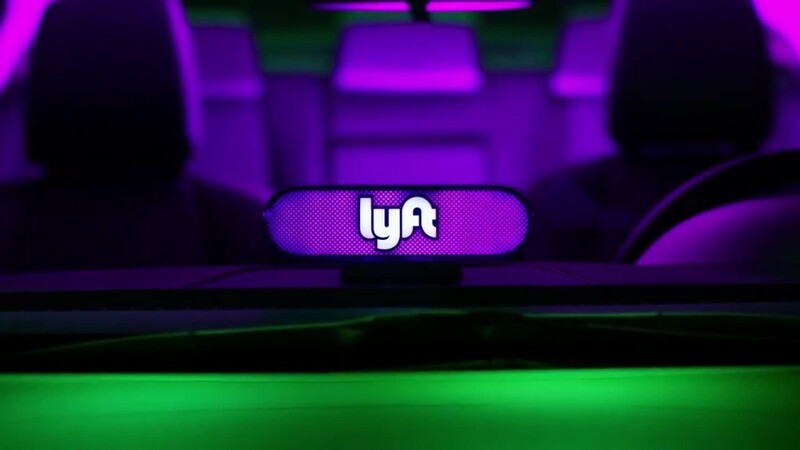 "If cities go this route, the result will be stronger, greener, and healthier communities," Lyft senior director of transportation policy Emily Castor Warren told CNN. "It will also mean a healthier, more secure future, for our families and our planet alike." Although there are many advantages to ride-sharing, the results aren't all rosy: A recent study found that New York traffic has worsened due to the trend. Ridesharing added 600 million miles to the city's roads in the last three years. In much of Manhattan, average vehicle speeds have fallen 13% since 2010. "The current trajectory we're on is a more congested, less walkable, less equitable city. That needs to change," Tumlin said. Lyft is open to congestion pricing in the U.S. European cities such as London and Stockholm are charging motorists for driving into the city center to cut down on congestion. Lyft's rival Uber has also endorsed congestion pricing in cities, but no U.S. city has taken embraced the model yet. "It's worked in Europe," Hasan Ikhrata, executive director of the Southern California Association of Governments told CNN. "It could work in Los Angeles."